"This is a popular rice dish from Portugal. 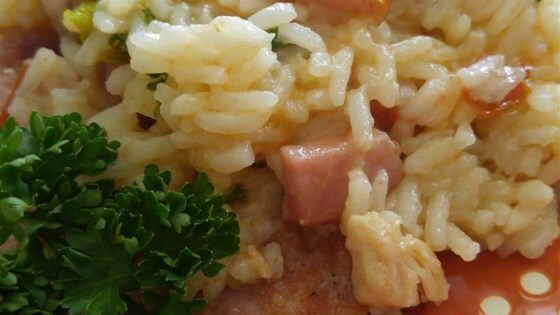 The rice is cooked with ham, sausage, chicken thighs, red bell pepper, and cabbage." Heat oil in a large saucepan over medium heat. Add onion, chicken thighs, and drumsticks; cook and stir until starting to brown, about 10 minutes. Add ham, smoked sausages, and fresh sausages. Cook and stir until golden brown, about 10 minutes. Stir rice, tomatoes, red bell pepper, spring onions, salt, and parsley into the saucepan. Pour in water and add chicken bouillon cubes. Reduce heat and simmer, partially covered, until flavors are combined, about 15 minutes. Stir in sliced cabbage. Continue to cook until rice is tender and water has been absorbed, about 15 minutes more. Drizzle olive oil over rice before serving. See how to make Chef John's hearty Portuguese Sausage Kale Soup. My family really didn't care for this recipe. I was just OK. Will probably not make again. Very tasty, needed a large cast iron ceramic lined casserole dish to finish it but the whole family loved it! Thanks sharing a taste of Portugal with us! The was very good. The changes I made were using chicken broth instead of water and only using 2 cups of raw white rice. came out very good. This is quick and easy! A colorful and flavorful one-pot dish that I would make again. I did have to add some more water to the rice while it was cooking.